Somehow I never liked broccoli cooked like alu gobhi. Whenever I would cook broccoli like Indian curries using my everyday curry powder it would be a mundane kind of subzi not comparable to alu gobhi at all. But that was when we were experimenting with the new vegetable in the market a decade ago. Now I like broccoli in the raw or blanched for mostly. But when the brccoli is not too fresh I need ideas to cook it too. This broccoli paneer bhurji is one of those ways to use up not so fresh broccoli that was left in the fridge. 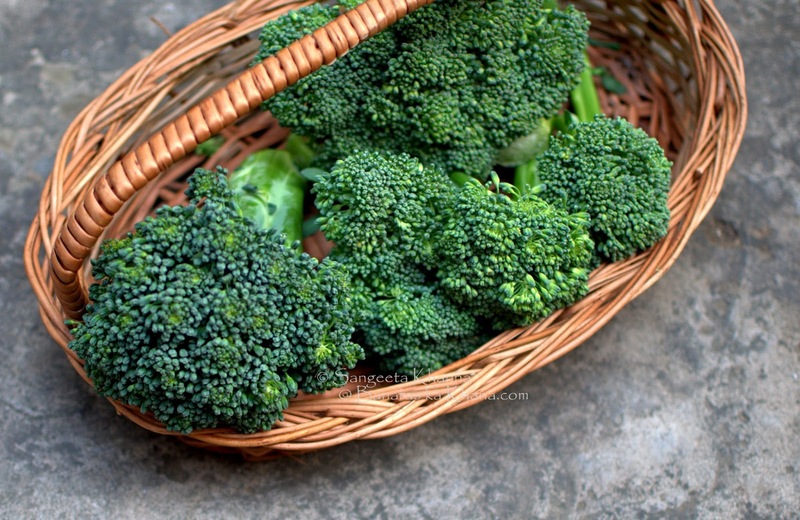 I had stopped cooking broccoli the Indian way and loved it in all Chinese recipes I cook and have been using it in many many salads and as a steamed vegetables on the side of a meat or fish meal. I love raw broccoli and lightly steamed broccoli in anything and everything. But then some vegetables are such that you tend to experiment with those a lot. I made a pesto with broccoli that was just okay nothing great and was never repeated. The broccoli soups were loved by all and became a way to consume all the excess broccoli I would end up buying every week in winters. On one of those weeks in winters when I had bought a lot of broccoli and was not able to finish them, I juts blanched a few of them and froze a huge bagful. Frozen broccoli can only be used in soups as we like it, and soups we don't normally have in summers here in India. What to do with that huge bag of frozen broccoli then? 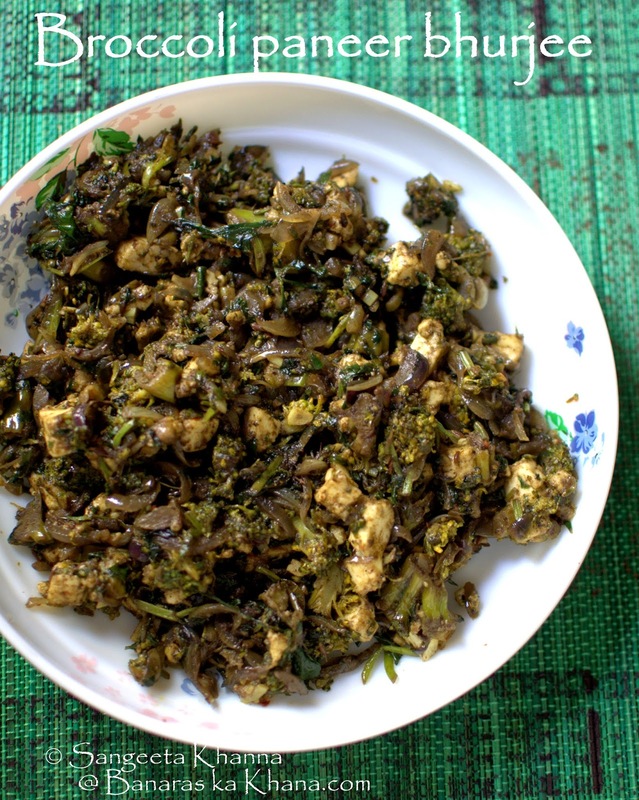 I decided to make a broccoli and paneer bhurji on the lines of palak paneer bhurji one fine day and it was such a good taste I finished all the stock frozen broccoli cooking this broccoli paneer bhurji. But honestly speaking I did not have any ideas to use frozen broccoli for extremely hot summers as soups were not an option and we like only fresh broccoli otherwise, frozen florets loose their texture. This broccoli paneer bhurji is the perfect answer for frozen or even stale and limp broccoli. Thankfully so. Heat the oil in a kadhai or pan and tip in the garlic first. Let it sizzle for a while and then add the sliced onions. Keep frying till the onions start getting caramelized. Add the powdered spices except amchoor powder, mix well and let them cook for a minute. Add the minced broccoli and mix well, cook covered on medium heat for about 5 minutes. Now add the chopped fenugreek leaves and the cubed paneer as well. Keep stirring and scrambling the paneer and greens in the pan as you cook. Within the next 2-3 minutes the bhurji will be ready. Add amchoor powder and mix well. Serve as desired. 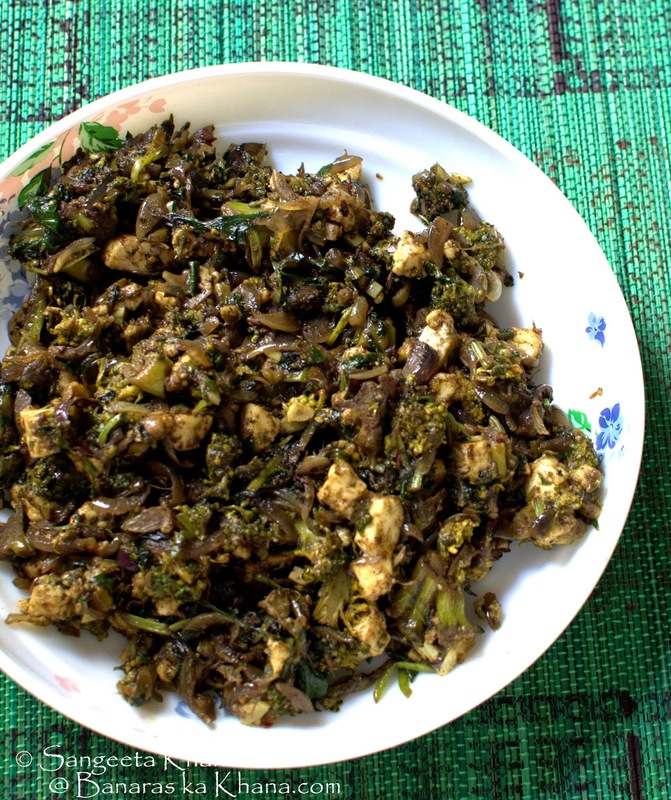 Broccoli and paneer bhurji is nowhere close to palak paneer bhurji, it is different but equally tasty. The caramelized onions impart a sweetness that balances the slight bitterness of fenugreek leaves and the broccoli adds body to these flavours. This was the first time I liked broccoli in an Indian spiced curry and I don't mind that the broccoli lost it's texture. We have to use frozen or stale broccoli sometimes and this is a good way to get a nutritious meal with that. We loved it both with ragi roti and with plain boiled rice. Are you trying this broccoli paneer bhurji? Let me know when you do.